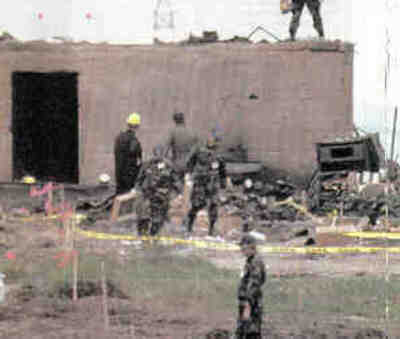 This photograph, published in US News and World Report, July 24, 1995, shows a red body flag at the extreme left margin of the picture in the grassy area (similar to the red body flag in Hole in Roof of Concrete Room). Under what circumstances did the person die? The official medical examiner's diagrams show no bodies recovered from this area. The fire had occurred on April 19 at noon. Yet Dr. Peerwani testified that he first visited the crime scene with forensic dentist Rodney Crow on April 21. "We examined the scene and in order to decide as to what sort of evacuation plan that we would institute, and following that, we returned back to Ft. Worth "sic"," he said (Transcript, pg. 5962). They decided that they would prepare a grid of the scene, "localize each and every body with a flag, we would then document the location of the body, diagrams and photographs, and following that, we would then carefully remove the body, place it on a white clean sheet and then secure that in a --in a trash bag. We had a truck there. We prepared for a refrigerated truck to store the bodies and then carry them to the Tarrant County Medical Examiner's Office. We also set into motion a process whereby we would examine the soil and the debris on and around the body, in order to collect body parts, tissues, the teeth and personal belongings that may have fallen off when the bodies were burned and destroyed," Dr. Peerwani said (Transcript, pg. 5962 and 5963). 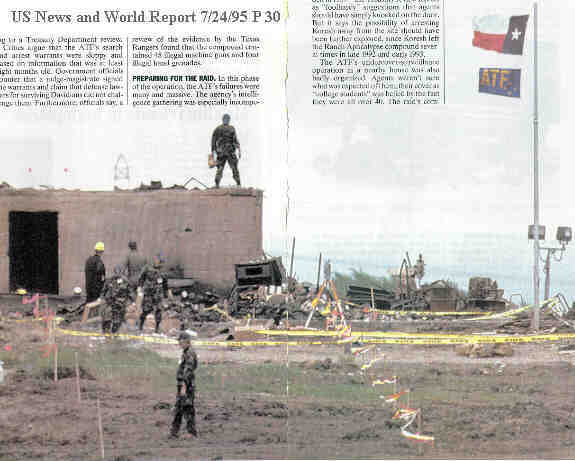 The photograph on the top of this page, taken from US News and World Report, July 24, 1995, shows a red body marker flag on the extreme left margin indicating the location of a body in the grassy area outside the ruined building. Note that the diagrams of the location of the bodies received from the office of the Justice of the Peace, Precinct 2, in McLennan County, show no bodies recovered in that location (Remains Recovered from Mt. Carmel, First Floor Surface, and Remains Recovered from Mt. Carmel, Exterior Grounds). Where did these bodies go, and if they do appear on the diagrams, what "recovery location" were they assigned? 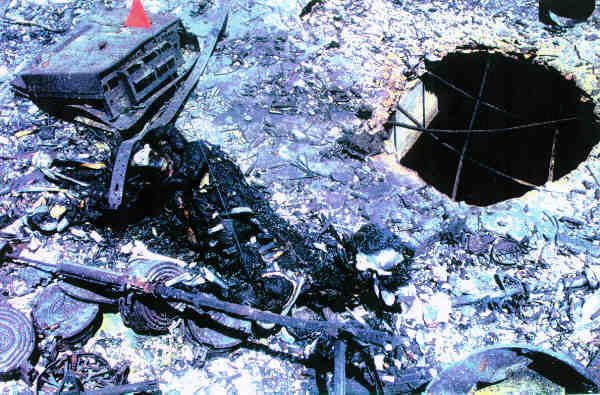 On April 20 FBI agent Jeffrey Jamar told the Washington Post (The Washington Post, April 21, 1993)) that more bodies of victims would be found in a sealed concrete room inside the "fortress," and that the cult's ammunition was "cooking" in molten wreckage and creating a minefield for forensic experts, delaying the recovery effort. How did Jamar know where the bodies would be found? If the room was sealed, as Jamar said, and the fire lasted only 40 minutes, why would he not assume he might find survivors? And unless it was already known the people were dead, why didn't rescue workers go into the concrete room immediately after the flames died down to check for survivors? "Loose lips sink ships." While organized anarchy reigned at the ruins, "federal explosives experts" were telling James Collier, Justice of the Peace in McLennan County, that a search for bodies would have to wait several more days--until Friday, April 23, maybe--for the ashes to cool off. See Chicago Tribune, April 21, 1993. The Mt. Carmel Center was under Judge Collier's local jurisdiction. Compare this information to Dr. Peerwani's trial testimony: "The first body that was in fact evacuated by the local justices of the peace and sent to us even before we went to Mount Carmel was MC Doe Number 1 . . ." (Transcript, pg. 5968). The cited source of the information was Dr. Rodney Crow, Dr. Peerwani's forensic dentist. In order for the schema to be included in an April 21 morning paper, it would have to in the hands of the paper by at least April 20. Once again we see that the people supposedly in charge--this time Dr. Peerwani--were not in charge, and that events were being guided by a hidden hand.